Much of the country has been hit pretty hard by Old Man Winter recently. So now would be a good time to think of milder temperatures, springtime activities, and things that warm the soul like expanding your nutrition expertise and professional development. 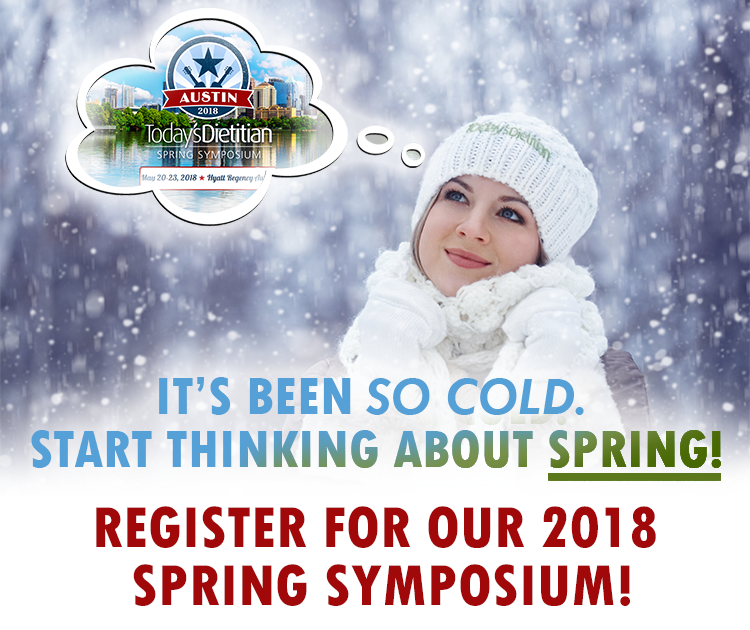 One event later this year that will help with all of those is our 5th annual Spring Symposium in Austin May 20-23. Register now to earn upwards of 15 CEUs in sessions and workshops presented by experts in the field of nutrition and dietetics. Plus, our program offers a variety of opportunities to interact and network with fellow dietitians, as well as our sponsor companies. on the program, presenters, hotel, sponsors, and special events. Plan an amazing spring and join us in Austin this May!